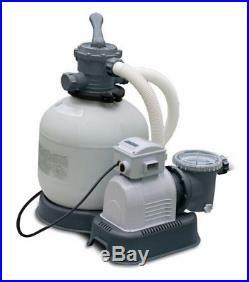 INTEX 3000 GPH Above Ground Pool Sand Filter Pump and INTEX Automatic Vacuum. Part Number: 28651EG + 28001E. INTEX 3000 GPH Krystal Clear Above Ground Pool Sand Filter. 6 function control enables you to easily maintain this filter pump system with settings for normal filtering, backwash, rinse, recirculate, drain, and close system. Filters up to 3,000 gallons of water per hour. Best suited for above ground pools with a 16-foot or larger diameter and a water capacity of 5,000 gallons or more. You'll love this package for your above-ground pool - includes an Intex sand filter pump and automatic vacuum. INTEX 3000 GPH Krystal Clear Above Ground Pool Sand Filter - 28651EG. The Intex 3000 GPH Krystal Clear Sand Filter Pump is an above-ground swimming pool pump that offers lots of advantages over cartridge filters and Diatomaceous Earth (DE) above-ground pumps. This sand filter pump is the most efficient and lowest maintenance filter option for your above-ground swimming pool. Plus, sand filter pumps tend to last 2 to 3 times longer than traditional filter cartridge pumps. The pump also includes a GFCI unit (US version) which has a safety shut-off and meets UL standards. 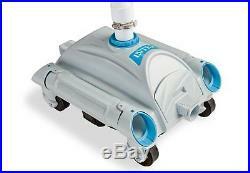 INTEX Automatic Above Ground Swimming Pool Vacuum Cleaner - 28001E. Take the work out of cleaning your swimming pool this season with the Intex Automatic Pool Vacuum. Connect this automatic pool vacuum to your existing filter pump (1,200-3,500 GPH) and this little workhorse does the rest. Using venturi suction, this automatic pool vacuum will keep the bottom of your pool clear of leaves and other debris. Spend less time cleaning your pool and more time enjoying it with the Intex Krystal Clear Sand Filter Pump and Intex Automatic Pool Vacuum! Works with smaller Intex above ground pools with the addition of hose adapters that will couple the pump's 1.5-inch diameter hose fittings to a smaller pool's 1.25-inch diameter valves. Easy to operate and maintain. Daily timer with daily cycle settings of 2, 4, 6, 8, or 12 hours. Includes a skimmer basket attached to the filter pump. Pump automatically collects most of your pool's floating surface debris. Does NOT include plunger valves and 1.5-inch inlet/outlet fittings. Skimmer works in conjunction with the sand filter pump. Includes the added safety feature of a built-in GFCI (Ground Fault Circuit Interrupter) - immediately shuts the unit off if needed to protect people from injury due to electric shock. Conforms to safety certifications and listings by UL and CSA and is rated 120 volt AC. Pump flow rate: 3,000 GPH. System flow rate: 2,450 GPH. Dimensions: 19.2 x 22.1 x 30.8 inches. INTEX Automatic Above Ground Swimming Pool Vacuum Cleaner. The newly designed Auto Pool Cleaner is a hassle-free solution as it effectively vacuums the entire pool floor automatically. Not suitable for in-ground pools, this pool cleaner was designed for Intex above ground swimming pools with 1.5-inch hose fittings and attaches to the inlet connector in the pool with a 24.5-inch hose. Requires a filter pump with a flow rate between 1,200-3,500 GPH. Intex Krystal Clear Sand Pump + Automatic Vacuum. All Intex products are rigorously tested and meet all international safety standards to provide years of fun for customers in over 100 countries throughout the world. Cancelling Your Order: Your order is important to us and will be processed immediately. Select the reason for the return. This listing is currently undergoing maintenance, we apologise for any inconvenience caused. The item "INTEX 3000 GPH Above Ground Pool Sand Filter Pump and INTEX Automatic Vacuum" is in sale since Tuesday, April 24, 2018. This item is in the category "Home & Garden\Yard, Garden & Outdoor Living\Pools & Spas\Pool Equipment & Parts\Pool Pumps". The seller is "vminnovations" and is located in Lincoln, Nebraska. This item can be shipped to United States.